Two Paths — Spiritual Path or Material Path? His Divine Grace Srila Kirtanananda Swami Bhaktipada — Tribute to a Pure Devotee?? 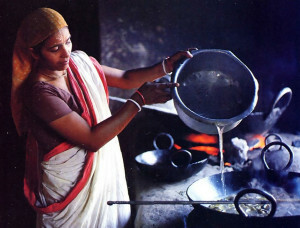 To the casual visitor, this holy land is much like the rest of rural India. To the devotee of Lord Caitanya it is a transcendental paradise. Time has all but stopped in Navadvipa – or so you’d think, seeing the ancient-looking riverboats and temples. Five hundred years ago in this transcendental land. Lord Caitanya appeared and began His great spiritual movement. First a long and tedious flight. Then retrieving baggage and waiting in long lines to clear Indian immigration and customs. 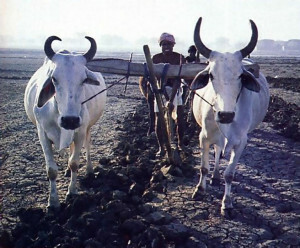 Then four hours on a bus bumping through Calcutta’s teeming streets and on through dozens of timeless, dusty villages. Finally the pilgrims sight the temple domes that stand high above the treetops in the holy land of Navadvipa. They feel relieved and alert with transcendental expectation. 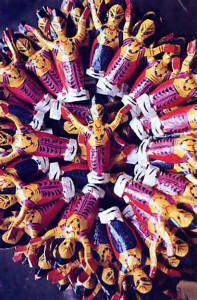 Navadvipa’s “skyline,” now a familiar sight to thousands of devotees throughout the world, is like a homecoming beacon that announces the journey’s end to weary travelers. To the uninformed, this spacious flat farming area near the junction of the Ganges and Jalangi rivers may seem like the rest of rural India. The heavy bulls turning clods of earth with hefty plows, the thatch-roofed mud houses, the ancient-looking riverboats, and the slight, wide-eyed people make the customary sights and conveniences of the West no more significant or relevant than a faint memory. 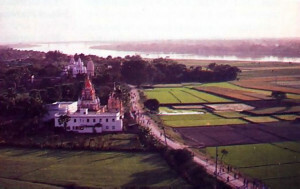 Navadvipa, literally ”Nine Islands,” is a sacred tract of land in West Bengal. The nine islands, sculpted by the fingers of the Ganges as she reaches down to the Bay of Bengal, are dotted with numerous towns and villages and checkered with plots of farmland—wheat, rice, beans, sugar cane—and occasional groves of bananas, coconuts, or papayas. 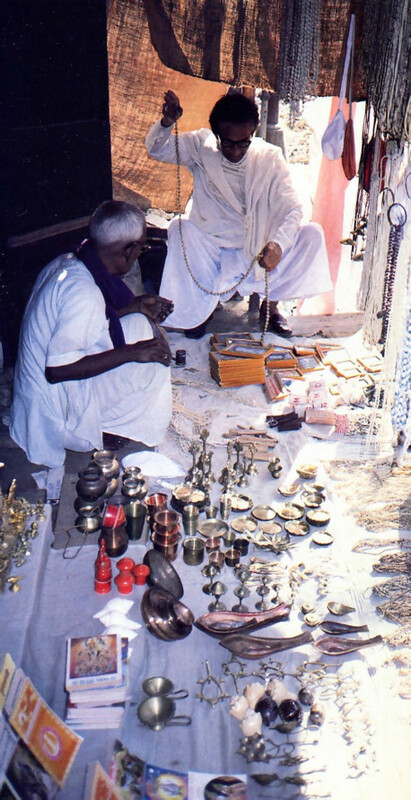 Spiritualized shop ping in the city of Navadvipa, where the goods are for worshiping and remembering Lord Caitanya. But Navadvipa is much more than a quaint, picturesque area where time has all but stopped. It is the birthplace of Lord Caitanya. * [*The present-day town of Navadvipa is a small city included within the nine islands, but Navadvipa the town is not the same as Navadvipa the nine islands. Lord Caitanya took birth on the island of Rudradvipa, near the present-day town of Mayapur.] It is transcendental. He wanted to fully relish the sweetness and depth of a devotee’s love, and He wanted to show people how to best evoke their dormant love of God. Because Lord Caitanya benevolently distributed that transcendent love to everyone, He is known as the most munificent incarnation. His method was sankirtana, the congregational chanting of the names of God. This, He taught, is the most expedient way to become self-realized in this age. Lord Caitanya is the ideal teacher of life’s prime necessities. He is the complete reservoir of all mercies and good fortune, and He is worshipable by everyone in this age of disagreement. Everyone can join in His sankirtana movement. No previous qualification is necessary. Just by following His teachings, anyone can become a perfect human being…. I sincerely hope that by understanding the teachings of Lord Caitanya, human society will experience a new light of spiritual life that will open the field of activity for the pure soul. The bus rumbles along the narrow winding road, looking incongruous among the bullock carts, rickshas, cows, goats, and pedestrians. The pilgrims peer out the windows. Five centuries ago. Lord Caitanya used to tread this very land daily, and the white-steepled temple that the bus passes marks the place where, on February 18, 1486, the Lord appeared. The funds to purchase the land and build this temple were raised by the great forefather of the Hare Krsna movement, Srila Bhaktivinoda Thakura. A century ago Srila Bhaktivinoda researched extensively to discover the exact site of Lord Caitanya’s birth. After his findings were confirmed by his spiritual master, he personally arranged for the construction of the sacred shrine that still stands today. 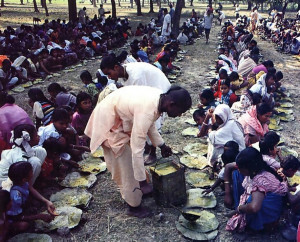 Each week at the Hare Krsna center in Mayapur, as well as in nearby villages, prasadam (food that has been offered to Krsna) is distributed free to all comers on simple leaf plates. Srila Bhaktivinoda also published a book revealing the importance of Navadvipa, and before he passed on, he instructed his son, Srila Bhaktisiddhanta, to continue his work. It’s because of the service of these great devotees and of Srila Bhaktisiddhanta’s disciple Srila Prabhupada that Navadvipa’s significance was established. At Srila Prabhupada’s temple, Mayapur Candrodaya Mandir, just one mile from Lord Caitanya’s birthplace, the bus finally stops. Each year since 1972 Srila Prabhupada’s disciples from all over the world have joined together in Navadvipa to celebrate the appearance day of Lord Caitanya. And this year will be the largest and grandest celebration—the quincentennial. What Srila Prabhupada and his predecessors and followers have done in broadcasting the glories of Navadvipa is similar to what Lord Caitanya and His followers did five hundred years ago to broadcast the glories of Vrndavana. 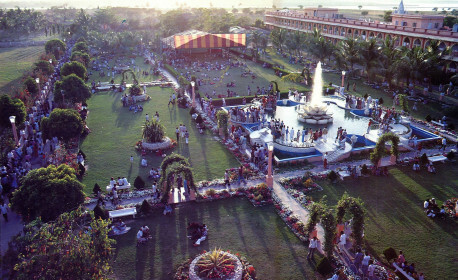 A grand celebration each year on the anniversary of Lord Caitanya Mahaprabhu’s appearance brings an international family of devotees to the Hare Krsna center in Mayapur. Vrndavana is a beautiful area not far from Delhi (but seven hundred miles from Navadvipa where Lord Krsna passed His childhood and youth during His appearance fifty centuries ago. Forty-five centuries later, when Lord Caitanya visited Vrndavana, it was a miniscule, relatively unheard-of and undeveloped farming village. Lord Caitanya requested six of His leading disciples to live there, establish temples, excavate the holy places of Krsna’s pastimes, and write books about Krsna consciousness. 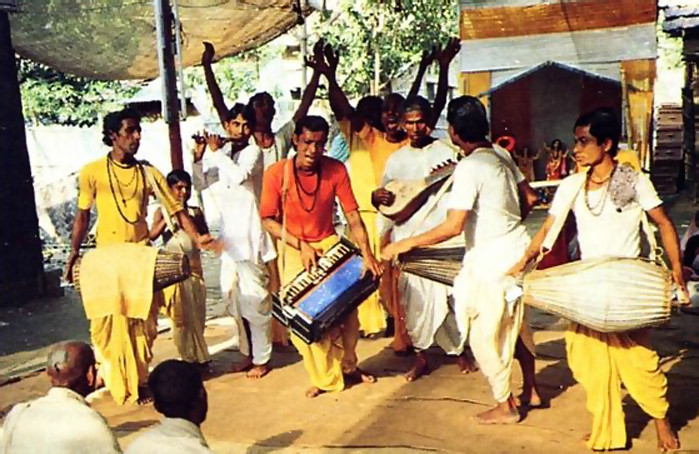 As a result, Vrndavana today is famous among all Hindus and devotees. 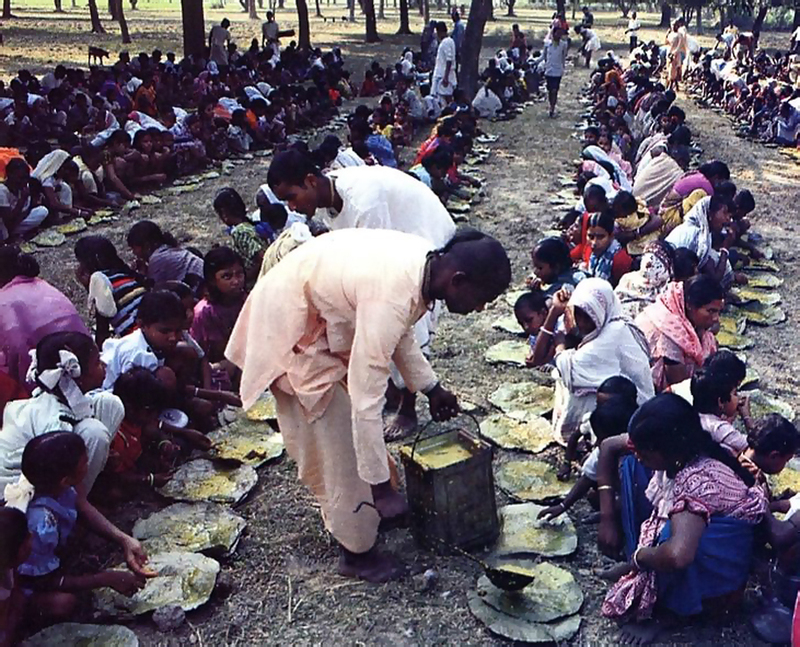 Hundreds of thousands of pilgrims regularly visit the thousands of temples and holy places of Vrndavana. In Navadvipa, Srila Bhaktivinoda, Srila Bhaktisiddhanta, and Srila Prabhupada have also founded temples, excavated the holy places of Lord Caitanya’s pastimes, and written books on Krsna consciousness. In one sense Vrndavana and Navadvipa are one, as much as Lord Krsna and Lord Caitanya are one, being the same Supreme Person in different features. But in another sense, although one, Vrndavana and Navadvipa are simultaneously different, as are Lord Krsna and Lord Caitanya. Navadvipa is the crest jewel of all holy places, being the most merciful of all. In other places of pilgrimage (like Vrndavana), an offender is severely punished, but in Navadvipa the offender is not only forgiven, he is purified and receives the treasure of love of God. One who lives in Navadvipa is very fortunate, for he attains ecstatic love for Krsna birth after birth. One who happens to go there becomes freed from all offenses. What one attains by traveling to all other holy places is attained just by remembering Navadvipa, and what yogis attain after ten years is attained in Navadvipa in three nights. The impersonal liberation one gets after arduous endeavor at other holy places you can get simply by bathing in the Ganges at Navadvipa. In fact, all material enjoyments and liberation remain as obedient servants to the pure devotees in Navadvipa. Therefore, give up all other desires and attractions and simply fix your mind intently on Navadvipa. However, reading this and experiencing Navadvipa may make one doubtful. Sometimes a pilgrim hears mundane cinema songs drift over the Ganges while he’s taking his sacred bath. Locals with not-so-innocent stares may inquire about his camera, watch, and tape recorder. And anyone who goes to the city of Navadvipa, on the western bank of the Ganges, will surely be struck by the lack of cleanliness and organization. Since no material thing or person is ever situated in Navadvipa, a film of dull matter has been spread over it to keep it covered from the materialist. The people who have no relationship with Lord Caitanya simply live on top of that covering, blind to the real truth. Though one is thinking, “I am in Navadvipa,” maya [illusion] happily keeps Navadvipa far away from that person. When the eastern horizon becomes tinged with the redness of sunrise, Lord Caitanya, taking His devotees with Him, journeys through the towns and villages of Navadvipa. The mrdangas resound and the hand cymbals play in time, and Lord Caitanya calls to the sleeping people, “Wake up, sleeping souls! Wake up, sleeping souls! You have slept so long on the lap of the witch Maya. I have brought the medicine for destroying the illusion of Maya. Chant this maha-mantra: Hare Krsna, Hare Krsna, Krsna Krsna, Hare Hare/ Hare Rama, Hare Rama, Rama Rama, Hare Hare. Navadvipa can be reached by chanting the holy names of God with faith and conviction. In this mood a pilgrim can begin his journey to Navadvipa, and before long he will surely arrive in that holy land.